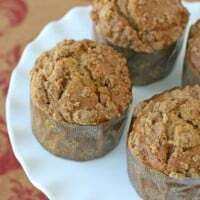 A special family holiday like Thanksgiving deserves extra special treats! 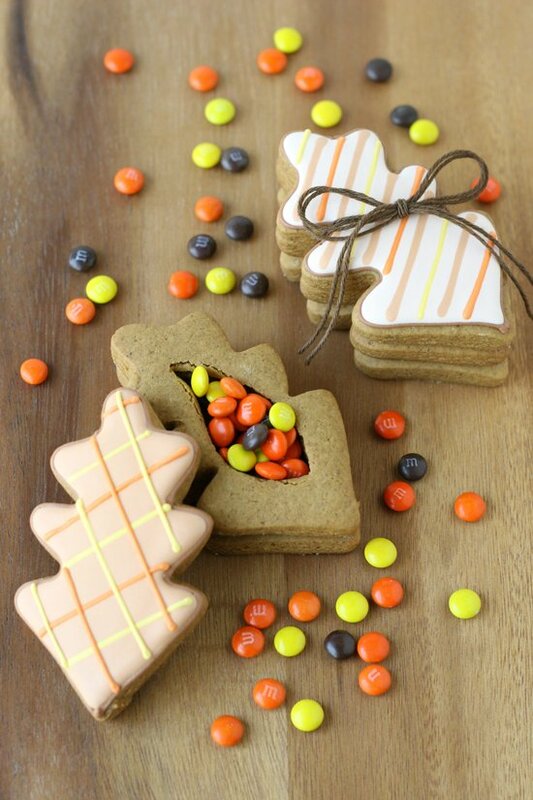 These Thanksgiving Cookie Boxes would make beautiful little favors perfect for a Thanksgiving place setting. Of course these little cookie boxes would be perfect for any fall gathering, or as a sweet little gift. I’m sure you remember I’ve made several fun cookie boxes before. I first came up with this concept (based off of an idea by Project Denneler) in 2012 with these 3D Pumpkin Cookies (which would be cute for Thanksgiving as well! ), and then I’ve had fun making Christmas Cookie Drums, Valentine’s Heart Cookie Boxes and Easter Egg Cookie Boxes. I recently saw sets of cookie cutters (at Wal-Mart) that were designed specifically to make cookie boxes! I made these Thanksgiving Cookie Boxes with Gingerbread cookie dough, but of course you could use a traditional vanilla Sugar Cookie Recipe, or my delicious Pumpkin Spice Cookie Recipe. Ready to make some cookies? 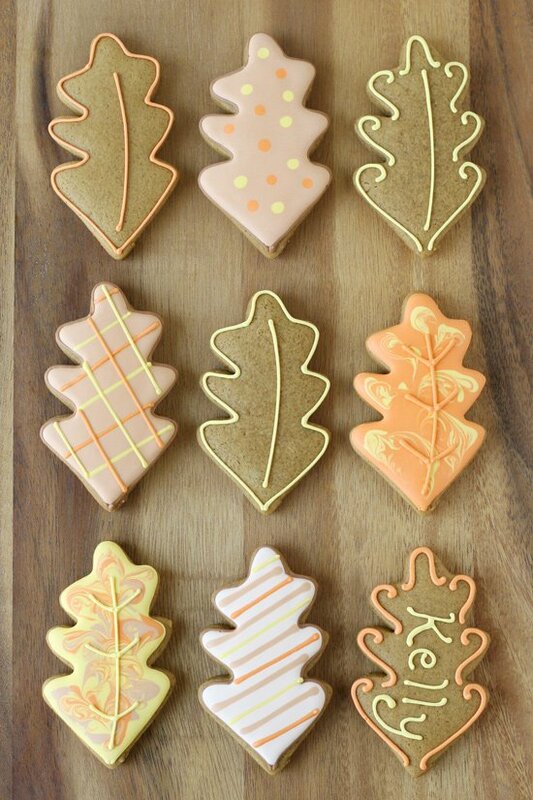 A leaf cookie cutter (here’s a similar cutter from Karen’s Cookies), and a smaller cutter of most any shape (could be a small circle, rectangle, or leaf) that fits inside the larger leaf cutter. You’ll see in the images below that I used a small leaf cutter from this set by Wilton. 1. Once you’ve made the cookie dough, cut out leaf shapes with your larger leaf cutter (as listed above). Bake whole cookies, you will remove the inside of a few cookies AFTER they are baked. 2. Once the cookies are baked, decide how many cookies you need to cut the center’s out of. For each finished cookie box you will need 2 whole cookies and one cookie with the center cutout. Cut out the centers of your cookies while the cookies are still very warm (fresh from the oven), and while they are still on the baking sheet. Allow them to cool several minutes on the baking sheet before attempting to move. 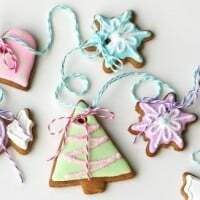 If by chance a cookie breaks while you are moving it, in many cases you can “glue” it back together with a bit of royal icing after it dries. 3. While the cookies cool fully, prepare your royal icing (recipe linked above). To assemble the cookie boxes, add a thin line of thick consistency royal icing to (back of) the cookie with the cut-out, then attach to a whole cookie (as pictured below). 4. Decorate the cookies that will be the top of your cookie boxes as desired. Allow icing to dry fully (8+ hours) before packaging. 5. Once the icing is fully dry, fill your cookie boxes with small candies (I used mini M&Ms), a little note or toy and share with people you love. 6. Tie a ribbon or string around the boxes if desired (as pictured at the end of this post), to keep the lids in place. Once baked, these gingerbread cookies will remain fresh at least a week. Store in an airtight container once the icing is fully dry. 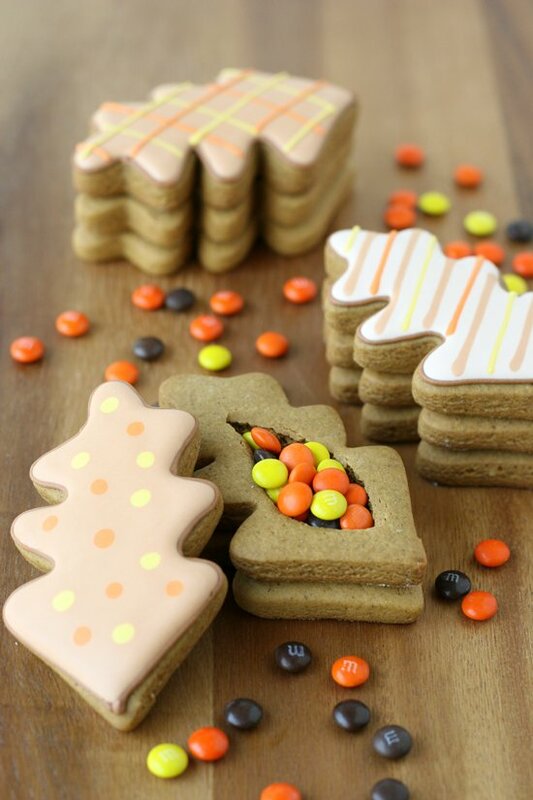 These Thanksgiving cookie boxes would be a welcome sight at any Thanksgiving table I’m sure! If you’re not up to making cookie boxes, these Sugar Cone Cornucopias that I recently shared, are an adorable options as well! Happy baking and treat making! These are so cute, Glory! LOVE! Adorable! They’d make super cute place settings. Love. What an awesome idea!!! 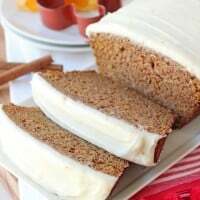 I love this and thank you so much for the recipe! I really love these. Any dessert that is three cookies in one AND is filled with yummy candy is a perfect TEN in my book. I look forward to making these in the future. These are so neat! I just know my kids would love them. Thanks so much! Kids especially seem to love that there is a surprise inside! I really love this idea of a surprise insie a cookie! These are such a great idea Glory! 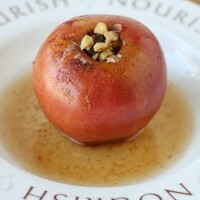 Such a fun idea for Thanksgiving Glory! Too, too cute! Glory, this is sheer genius! I’ve never seen anything like it – this will be a wonderful project to tackle with the kids while they’re off this week!